Turner was of course born a very short distance away in Maiden Lane. 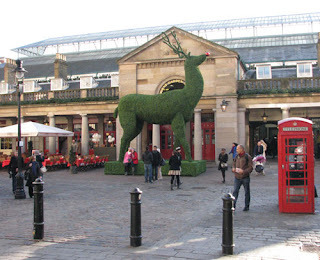 This is inbetween Covent Garden Piazza (where I sketched in the morning - see previous post) and the Strand. Turner was born near Covent Garden in London and entered the Royal Academy Schools in 1789. His earliest works form part of the 18th-century topographical tradition. He was soon inspired by 17th-century Dutch artists such as Willem van der Velde, and by the Italianate landscapes of Claude and Richard Wilson. He exhibited watercolours at the Royal Academy from 1790, and oils from 1796. In 1840 he met the critic John Ruskin, who became the great champion of his work. Turner became interested in contemporary technology, as can be seen from 'The Fighting Temeraire' and 'Rain, Steam and Speed'. At the time his free, expressive treatment of these subjects was criticised, but it is now widely appreciated. The bulk of his work - which was bequeathed to the nation on his death - is looked after by Tate Britain. However a few of the most famous paintings hang in the National Gallery - and this room forms part of my high speed tour of the National Gallery for visitors to London. Room 34 also contains paintings by John Constable, Gainsborough and Reynolds. Click the link to read more about it. Sometimes you realise you haven't seen somebody's blog in a while. I've got my blogrolls set up so that they show the top five or top ten of those I have listed in a category. Which means if you don't post in a while I have to remember that I should be seeing your blog posts - but they're not there. 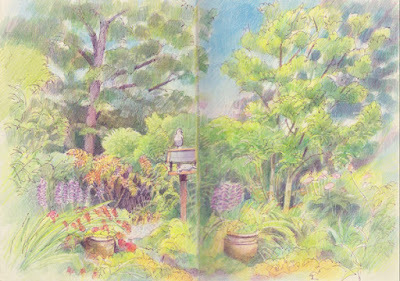 I was really shocked to find out this week that the reason that Debbie Kotter Caspari's sketchbook blog Drawing the Motmot hasn't been showing up recently, in my blogroll over in the nature section on Making A Mark, is that her home was blown away by an EF4 tornado in May. Quite literally. 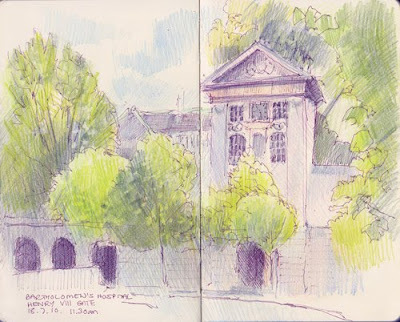 These blog posts record the event - and how Debbie found her sketchbooks from her travels. My reason for posting this here? I can't do any better than quote Debbie from her last post. 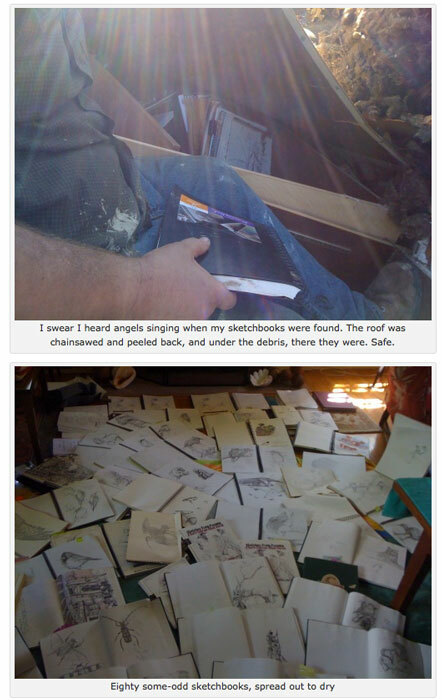 "I swear I heard angels singing when my sketchbooks were found"
It reminded me of one of the reasons why I'm glad I blog about my travels and the sketches I do. Computers may come and go - but once the images are on my blog they are there forever. This is a long overdue post about meeting up with Liz Steel (Liz and Borromini) and Alison Staite (Art Journey) at the Royal Botanic Gardens at Kew in September. Of course Borrowmini - as you can see below - was also there as well. 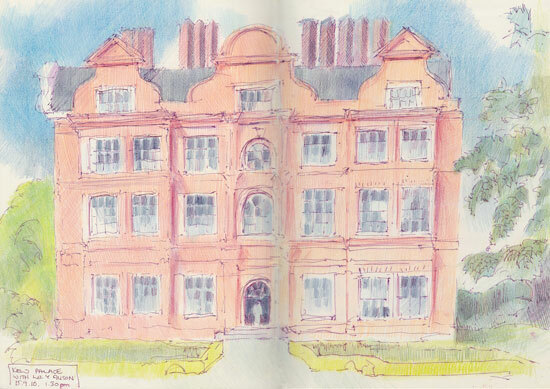 Liz and I sketched Kew Palace while Alison took photos! We talked non-stop from when Liz arrived, all through the visit to the Waterlily House, all through the sketching, through our very late lunch in the Orangerie and didn't stop until I had to leave to go and get ready for the Threadneedle Dinner that evening. Well if somebody is only over from Australia once in a while you don't want to waste any time! 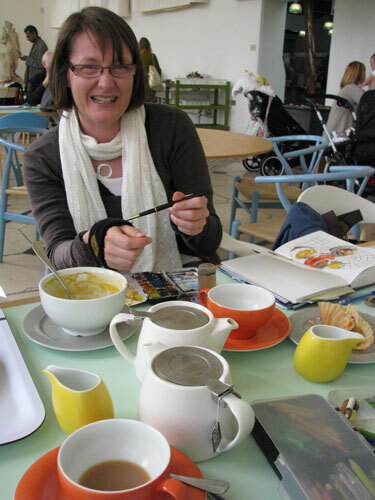 Here's an action shot of Liz sketching lunch - see the crockery and the sketch in the same shot! I loved her sweatband/brush wiper - that's a new one on me. I do so enjoy meeting up with people I've got to know online. So often they are exactly as I expect them to be. It was great meeting up and I hope we get to do it again sometime. Maybe next time in Australia! Kew Palace is looked after by the Historic Royal Palaces Trust. It was reopened to the public not that long ago after a very long and throrough restoration which took some 10 years. Kew Palace is the oldest building at Kew Gardens and used to be known as the Dutch House. It was used royal monarchs and their family between 1728 and 1898. Queen Caroline leased several parcels of land and buildings in the hamlet of Kew which included Kew Palace while her husband King George II worked on extending Richmond Gardens. Her son, King George III lived in various properties at Kew. He bought Kew Palace in 1781 as a family home. In December 1896, Queen Victoria agreed to Kew's acquisition of the Palace, providing there was no alteration to the room in which Queen Charlotte died. In 1898, the Kew's Department of Works acquired the Palace and it was opened to the public. At the rear is the Queen's Garden. This has been developed in the style of a seventeenth century garden and has only plants associated with the period. 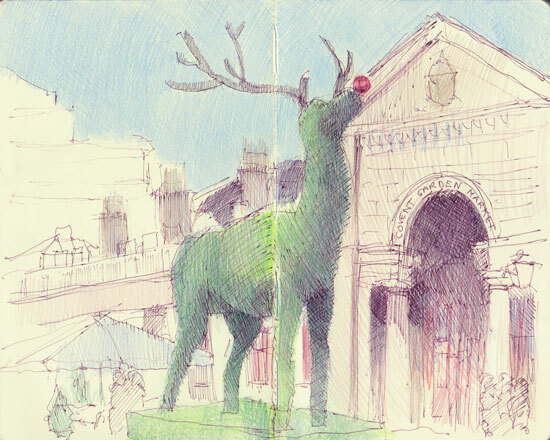 Leadenhall Market Christmas Tree - hanging the lights 14.11.10.
pen and ink and coloured pencils in Large Moleskine Sketchbook, 11" x 11"
Today, the RWS Sketching Group were out and about in the City of London on a day which progressed from spots of rain to drizzle to heavy rain. 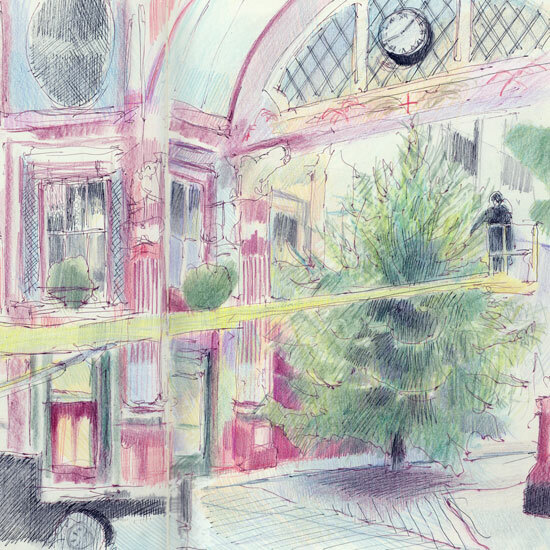 So I opted for sketching in Leadenhall Market where they were putting up the Christmas Tree outside the Brokers Wine Bar where one of my exhibitions was in March this year. Apparently this week is the Winter Festival in the Market and the Lord Mayor of London is due to formally light up the lights on Friday 19th November at 5pm. This sketch is of the lights being hung. It was quite intriguing watching three blokes work out where they all needed to go! I think I may well return and do a late afternoon/early evening one of the lights on. pen and sepia ink and coloured pencils in Molsekine Sketchbook, 8" ax 10"
A review will follow on Making A Mark however this is about my sketch done as I watched people looking at the paintings. The above sketch, across double page spread in my small Moleskine, is an exercise in drawing people and trying to capture their postures in just a few seconds. In other words, how real can I make people look when there is no time at all and they're not posing for me. It made me glad I've done life drawing classes with warm up exercises of a few seconds for each pose! It also reminded me of the tip which I first read about in a Charles Reid book of making sure that you go for the big shape when drawing groups of people. You know they're separate people but often the lighting doesn't separate them effectively. Thus trying to draw them as separate people can make them look a little unreal - while joined up they look perfectly normal! The people are not all there at the same time. I did them one by one and filled in gaps as people came and went. The trick was to make sure I got the height right. Towards the end of the sketch I got very distracted by the highly polished floor - its colours and the shadows from the people as they moved around the room. It soon became clear to me that what would make the sketch 'real' would be to try and capture the multi-colour and diffuse nature of the coloured shadow shapes on the floor. What do you think? That floor was fascinating - I could really get into drawing shiny floors! This is my very first digital sketch on my brand new iPad. It's the direct result of learning how to use Brushes - with no manual or instruction - while sat on the leather sofas in the Friends Room at the Royal Academy. I was quite pleased to end up with ANYTHING which looked remotely like a drawing! However I can now see the potential of the iPad as a sketchbook and will be doing this again. Although I might practice a bit more first! It's a bit of an odd sketch since it has the capacious and comfortable black leather sofa under the window at the bottom and then the wet courtyard of Burlington House out the window behind. Two elderly ladies watched me while they had their cup of tea and came up and asked me about it before they left. They were very intrigued and absolutely loved the way the picture swivels when I turned it towards them. Anyway - what do you think? Any good? I had a little bit of a fright as I left the RA and walked out under the archway to Piccadilly. There was police incident tape absolutely everywhere. It turned out that there was a "suspect vehicle" (which in London is code for "suspect bomb") parked not very far away and the Police had closed down the whole of Piccadilly. It's a long time since a policeman has said to me "I wouldn't look that way" as I turned around to peer and see where it was. Realising that white van man had parked a bit too close for comfort I scurried away to the tube - all the while doing mental calculations about the value of the artwork currently residing in the exhibition galleries inside Burlington House! 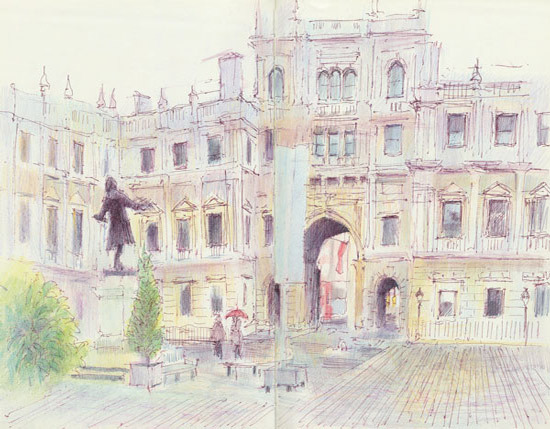 This is a sketch of the courtyard of Burlington House, off Piccadilly, drawn from the covered terrace in front of the Royal Academy of Arts. Our Drawing London Group in late September was supposed to be visiting my local park in East London but I spotted that the forecast was for heavy rain so we needed to relocate to somewhere which offered a variety of drawing locations which were dry. We were sheltering from the rain under the covered verandah at the front of the RA but even so I had to keep moving back as the drizzle drifted onto my sketchbook as the wind changed! However the rain did make for some interesting challanges such as trying (as with the Tate ketch) to find colours in the grey day and neutral stone of the building and courtyard. It was there to find but you had to look hard and find the nuances. Two gents at the table next to me were having this very intent conversation about the cosmos and movements of the planets and planetary houses (as per astrology) while I sat and eat my crayfish and rocket on brown. After 10 minutes of drawing people, the sketch was christened "The Cosmic Conversation"! I've just started to use the Royal Academy Sketchbook (20cm square) which is a casebound sewn sketchbook containing 80 leaves (160 pages) of mouldmade Stockwell catridge paper. It has different images by the members of the RA - mine's got a very nice by Fred Cuming RA who's one of my favourite ever painters. 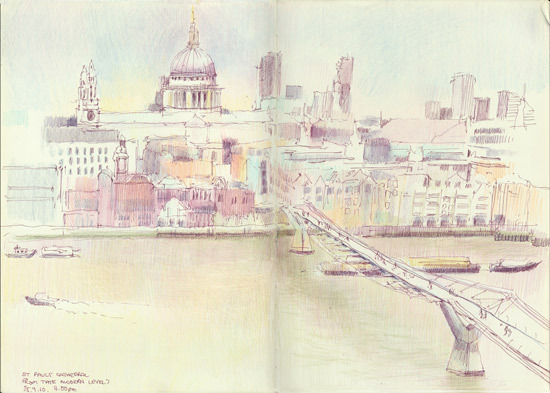 pen and sepia ink and coloured pencils, 11 x 17"
One of the great views in London is from the bar/restaurant on Level 7 of Tate Modern across to St Paul's cathedral and the skyline of the City of London. Lots of Wren churches peeping out inbetween office blocks in varying shades of "blah". The thing is when I'm drawing urban landscapes on a very grey day, I always find I'm looking for ANY colour which stop it being an unremitting grey. The other very entertaining part about sitting in the bar at the Tate is the fantastic variety of foreign tourists who come and sit next to you and talk about all manner of things under the sun. They all seem to love the cream tea though. I was good and drew a line and contented myself with Jasmine Tea! 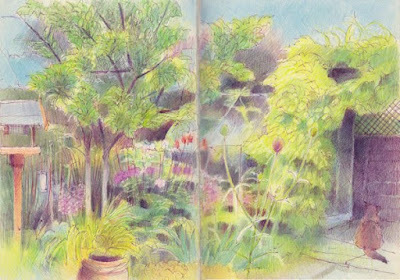 penc and ink and coloured pencils in small Moleskine sketchbook, 8" x 10"
This sketch was done at the end of August. I'm next to the River Thames at Richmond looking west towards Richmond Bridge. The early evening rowers and lovers were out and about. Actually, there were lots more people walking along the Thames Path but I didn't have time to draw them all in so it looks a bit more romantic than it actually was! I am soooooooo behind with posting sketches! We spent a couple of days visiting Richmond, Twickenham and Ham this summer and there are a couple more sketches to post of Eel Pie Island and Ham Common Pond. I've decided I need to visit more often as there are lots of opportunities for sketching combined with exercise - not least from the top of Richmond Hill - plus the autumn colours should be excellent! Tate People - Get a room! 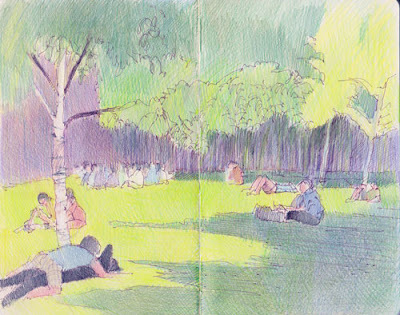 I'm either getting older or the tourists are getting friskier - but my jaw did drop rather when I sat down to sketch the people sitting on the lawn in front of Tate Modern last week. Some of them weren't sitting! Frank does great images of London - mostly screenprints but latterly paintings as well. 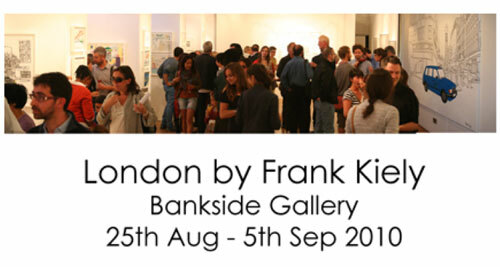 He's got a Meet the Artist reception tonight Thursday the 2nd of September at the Bankside Gallery 6 - 8pm. It's a great opportunity for those of you intrigued about the how, when & why behind his London works. 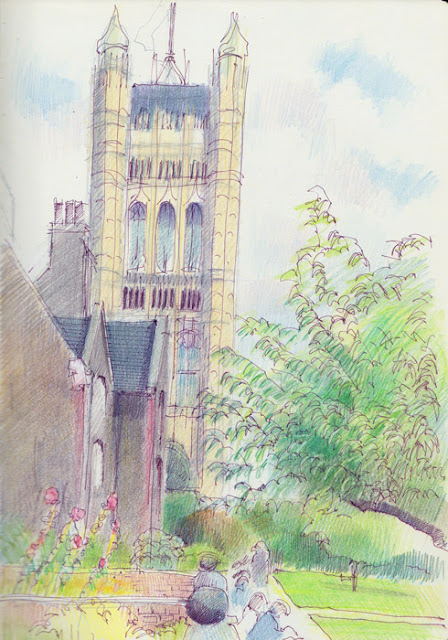 pen and ink and coloured pencils, 11.5" x 8"
This is a sketch of the Victoria Tower which is part of the Palace of Westminster. It's the big square stone tower, 98.5 metres/323 feet tall, at the southern (opposite) end from Big Ben. The Union Flag flies on the top when Parliament is in session and inside they keep all the Parliamentary archives. Most UK readers will be familiar with watching parliamentary reports on television from TV correspondents interviewing MPs standing on College Green which is just the other side of the medieval wall at the far side of the garden inbetween the Garden and the Tower. College Garden used to be the infirmary garden of the monastery adjoing Westminster Abbey, and it is said to be the oldest garden in England under continuous cultivation. Ahem....the Victoria Tower is not falling over. I made the fatal mistake of not checking my verticals when I started to draw and I have a distinct tendency to get leaning structures if I don't do this! I normally forget to take a photo so this is a rare example a sketch in progress! Yesterday I went to the Mall Galleries to see the Watercolour Academy Exhibition and had a cup of tea and a sketch as is my usual practice after viewing the exhibition. This time I remembered to take a photograph of the sketch in progress. I did a bit more to the colours when I got home but all drawing in was done at the gallery. This was taken just after the ladies who I had been sketching had got up and left - via a trip to view my sketch! As always I draw figures rather than faces and often draw people from behind so nobody is recognisable - so no objections possible! The exhibition review of Watercolour Academy will be on Making A Mark shortly - and the exhibition closes on Friday. It's worth a visit. 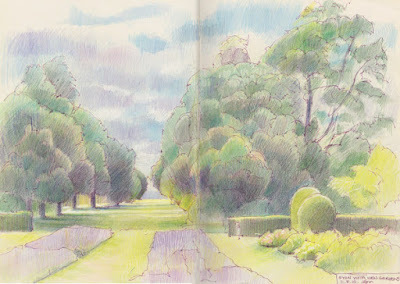 Last week we went to Kew Gardens and I sat on the steps leading up to the Palm House and drew Syon Vista with the new Lavender beds in the foreground. This is my plein air sketch. 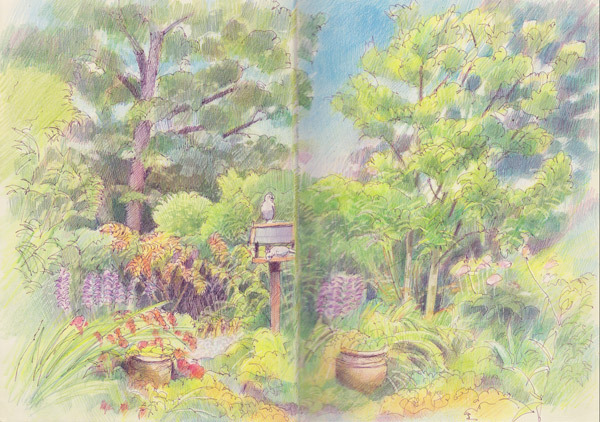 I'm really enjoying my large Moleskine sketchbook as a double page spread gives me a good size to work with. You can see the photos I took while trying to work out the best composition in Kew Gardens 11th August 2010 on Flickr. 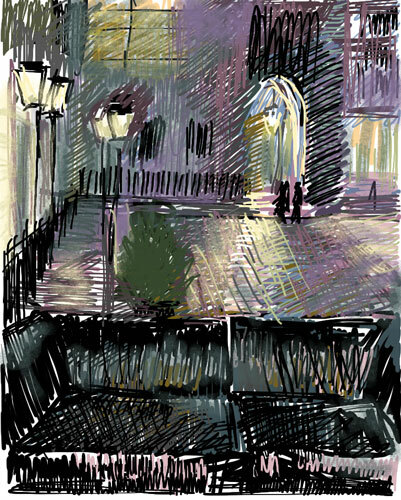 I find that using the LCD screen on a digital camera is a really good way of working out a crop for a plein air sketch. I went for a cropped further version of the second photo. As always when posting these sketches I end up learning a bit more about the history and heritage of an aspect of the Royal Botanical Gardens at Kew. Syon Vista is a major feature in the Nesfield/Burton landscape. This part of the Gardens was originally part of Richmond Gardens, but its character is dominated by the 1845 and later design of Nesfield and the Hookers. 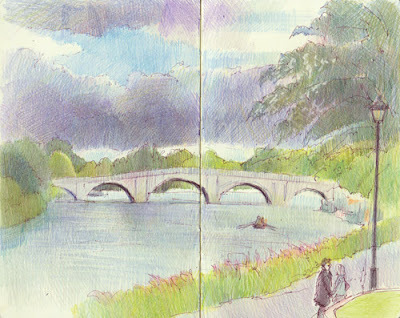 The view along the Vista to Syon House across the Thames make this possibly one of the the most visited areas at Kew. Nesfield was at first a soldier who later turned to drawing water colours. However, he found his real vocation in landscape design, gaining his first commission in 1836. This was the start of a long flourishing career, working on over 260 estates belonging to the most wealthy and influential people of the day. In 1844, he was asked to re-design the arboretum at Kew. His extensive plans included a number of vistas stemming from the Palm House, a parterre, the remodelling of the formal structure landscape around the Palm House as well as the Palm House Pond. One vista pointed south, called the Pagoda Vista, another facing west towards the Thames was called the Syon Vista. Although eroded in detail by time, Nesfield’s formal structured landscapes surrounding the Palm House, as well as his arboretum design and vistas, have largely kept their structure today. I've added a "location" to this post but I'm not quite sure how this works in Bloggger - just off to find out. I love sketching interiors landscapes - of places where people eat and drink. 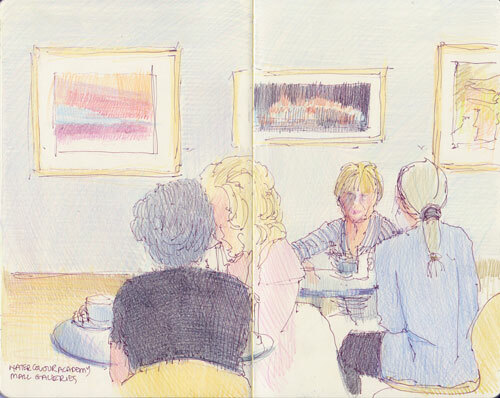 One person who does something very similar is inveterate sketcher Liz Steel (Liz and Borrowmini) - however in her sketches she mainly focuses on tea rooms and the still life landscape of the tea table. Have you developed a series of sketches of 'interior landscapes' with a theme? 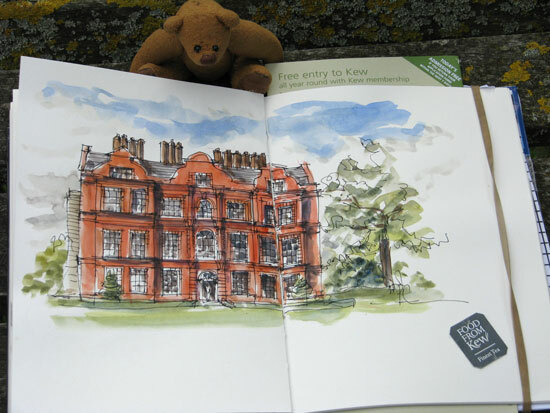 Liz is currently on her travels - sketching her way around the USA, UK and Europe - why not follow her on her blog? This is what's known as incredibly lazy sketching - done entirely while sat in an armchair next to my Mother's glazed door into her garden. It was very satisfying to do as it's a scene I know well and yet had never drawn - possibly due to the number of trees in this view. Intermittent showers meant that the planned gardening wasn't a great idea. Plus the image of the doves sitting on top of the bird house meant that it was absolutely necessary to sketch! My other cat Polly sat next to me at the open door absolutely transfixed by the doves as they preened and pecked. I think she was only a quarter of the way through the door when they took off - having teased her for quite a long time. What was slightly amazing to me on my journey north was to find that while London and the Southeast now closely resembles scorched earth due to lack of rain (shades of the summer of 1976), North West England has been getting a lot of rain - hence the garden was very lush with multiple variations on the colour green. However even there they are having to close down sections of the canal system as the reservoirs which feed the canals lock system are so low. Mind you I reckon he was indulging in wishful thinking about it really as he's now ten, carrying a bit more weight than he used to and doesn't race up and down vertical surfaces quite the way he did when younger. Although he still makes regular appearances on the top of the doors at home. St John Bread and Wine, Spitalfields is an offshoot from the awardwinning St John Bar and Restaurant restaurant in Smithfield which I rather like. Both are run by Fergus Henderson who's a big believer in nose to tail eating and has created what's regarded by many as a bit of a foodie favourite. Tim Hayward (The Guardian's food blogger on Word of Mouth) spent the morning with Fergus at St. John recently preparing, cooking, and eating a pigs' head. St John Bread and Wine opens for breakfast and progresses through elevenses to lunch and then supper. In fact one could actually stay all day. Tracy Emin who lives in Spitalfields did just that and has written a review of St John Bread and Wine - although to be honest I can't out whether this review is by her or whether the site is compiled by a fan of Tracey. There again it could be both! 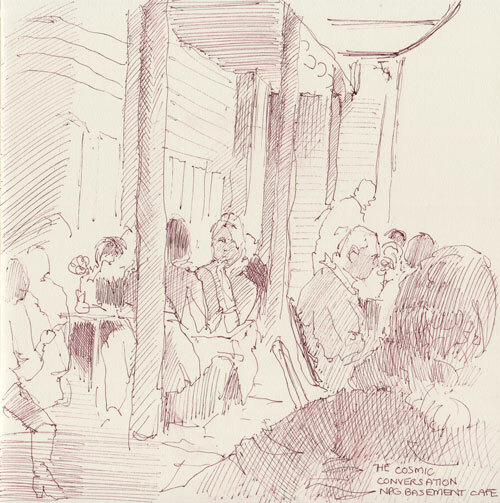 I was there with my drawing group and as they got up to go and sketch in and around Spitalfields Market I decided to sit and have another cup of coffee and do a quick sketch. It turned out to be a bit longer than a quick sketch as people came and went - and I never left until it was time to meet up for lunch! What I really liked about it was that it has all white walls so I had to find the colours in the shadows. I also very much enjoyed the matrix effect of the kitchen area - and the fact that all the chefs and kitchen staff came out to eat their meal in the restaurant before the lunch trade got going. I see from their website that they're opening a hotel at 1 Leicester Street, London WC2H 7BL in the bulding where Manzi's Fish Restaurant used to be in October. I'm sure I shall find time to pay it a visit when gallery visiting! The above sketch is of course another addition to my Interior Landscapes collection of sketches of places where people eat and drink. 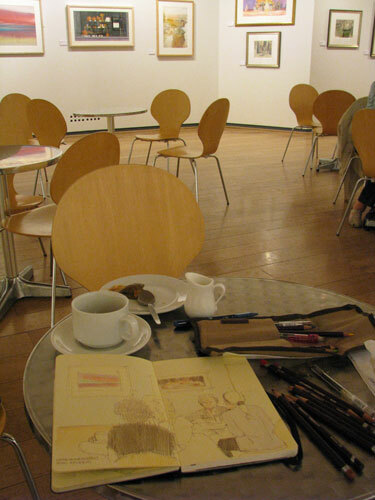 When I visit the National Portrait Gallery I quite often take time out in the Portrait Cafe in the basement if I'm going somewhere else afterwards. They have nice food and it's almost always quiet and peaceful. It also has this very curious design insofar as it's long and thin and is the shape of the space between the railings and the building at ground floor level. The wall seems to be some sort of polished concrete and the roof is glass and that's the only light into the space. It's a bit of a challenge to draw because all your normal mental measures of what's 'normal' don't apply! This sketch reminds me of a bit of a break through moment for me. This was when I realised that flat surfaces actually look more normal if they're not portrayed as having only one colour. There's colour variations in every flat surface of you look hard enough. I forget how many colours there are in the wall - but it's at least six and probably nearer 10. 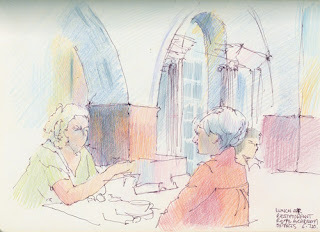 This post was very nearly called "why I love sketching from cafes". I get a table and chair and drinks to order - plus it's very "conveninent" if I have too many drinks! Then there's the ear-wigging aspect which can often be very entertaining. This morning I got a complete unexpurgated analysis of the politics of an architects office and the ramifications of doing PR for the LibDems. It's amazing how people think you go deaf when you're sketching right next to them! This morning, I was sat outside Carluccios in West Smithfield this morning. For the first sketch, I had a cappuccino and sat to the right of the door looking towards St Batholomew's Hospital and sketched the Henry VIII Gate into the Hospital. It was founded, with the Priory of St Bartholomew, in 1123 by Rahere, formerly a courtier of Henry I.
Refounded by Henry VIII, who signed an agreement granting the hospital to the City of London. The Priory was closed as part of Henry VIII’s dissolution of the monasteries in 1539, and although the Hospital was allowed to continue, its future was very uncertain as it had no income with which to carry out its functions. The citizens of London, concerned about the disappearance of provision for the sick poor, and alarmed at the possibility of plague breaking out, petitioned the king for the grant of four hospitals in the City including St Bartholomew’s. Henry finally relented; near the end of his life he issued two documents, one a signed Agreement dated December 1546 granting the Hospital to the City of London, and the other Letters Patent of January 1547 endowing it with properties and income. Along with Bethlem, Bridewell and St Thomas’, St Bartholomew’s became one of four Royal Hospitals administered by the City. For the second sketch, I picked up my stuff and moved to the left of the door and had another cappuccino - followed by lunch of Insalate di Mare (Mediterranean prawns, squid rings and mussels in a light lemon oil and chilli dressing served on mixed leaves - and very nice it was too!) 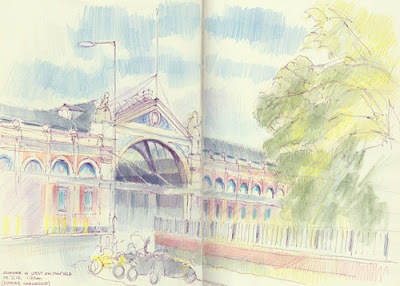 - and looked left to sketch Smithfield Market. I sketched Smithfield Market in the Spring - see The Courtauld, Old Bank of England and West Smithfield (April 25 2010) - and I this means I need to come back in the Autumn and Winter to sketch it again. This is the "original sketch" which took a little over an hour. I'll probably continue to work on it to finish off the tree and the sky and deepn some of the values. Plus this scan is looking a bit weird and needs sorting! 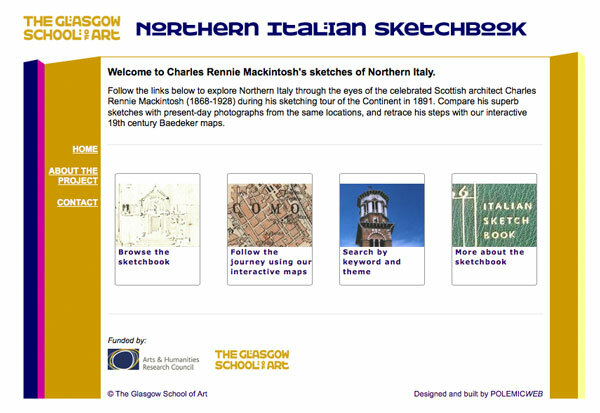 The Glasgow School of Art has developed a wonderful website which allows us to see the sketches of Charles Rennie Mackintosh (1868-1928). I adore Mackintosh's drawing style and can stare at his drawings and sketches and paintings for hours and hours - so finding this site is very special for me! 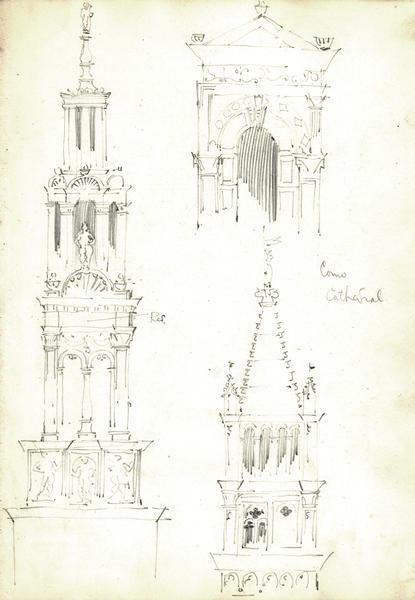 It also contains several pages of designs for the Glasgow Art Club (1892-3) and the Glasgow Herald Building (1893-5). If you use the search facility, it also shows you photos of the place today. Most of the sketches are in pencil and some are now a tad faint. However there are a few where colour has been added in watercolour. 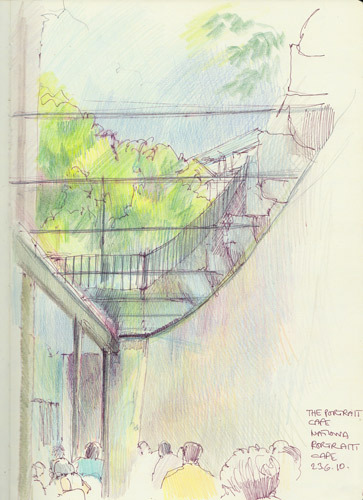 He doesn't draw people - he draws buildings and most particularly he draws bits of buildings. He's working out how the structure and ornamentation work. What I like about is as a facsimile sketchbook is it shows you exactly what a real sketchbook looks like - even one kept by somebody who is technically very proficient at drawing. It has all the unfinished sketches and the ones that went wrong and the bits of this and that which make it very real for me. 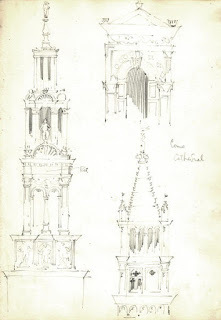 It's also very apparent, as one might expect, that he loves drawing architectural details. He fills pages with unpicking and reassembling the twirly bits! Finally, I have to add that I am very impressed by the Glasgow School of Art. They appear to be one of the few art schools in the UK which have really grasped the potential of IT and the internet for sharing the riches of our artistic heritage. Often, people start out on a path to learning about art because of the images they have seen and have been able to study. I'm very grateful for their enlightened approach which allows others to share and be inspired by Mackintosh's talents and skills in drawing. I always look forward to getting an email to say that Enrique Flores (acuarelista) has got a new YouTube video of a new sketchbook. This is his Moleskine Sketchbook completed during one week in Oran, Algeria. Lots and lots of sketches - he's sketching all the time and/or sketches very fast and so he fills a sketchbook in a week. Flat watercolour goes on faster than gradated washes - and he makes good use of lots of areas of flat colour. 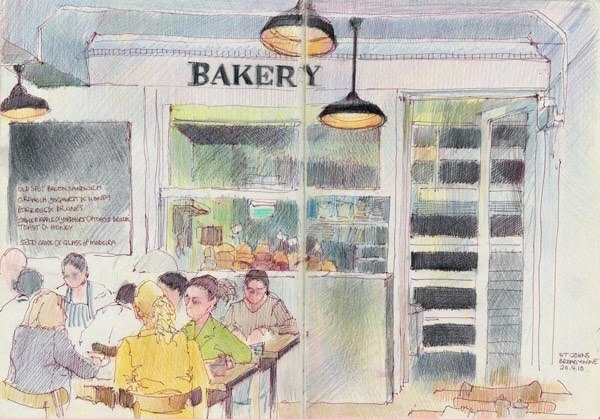 He draws lots of people - which make a place come alive. He comments on his blog that he has a 'redraw obsession' - but drawing again things you have drawn before is never a bad idea in my book! See also my post back in 2007 - Enrique Flores sketches everywhere! which includes an interview with Enrique. After the Press View for Sargent and the Sea, which opens today at the Royal Academy of Arts (see my review Sargent and the Beach on Making A Mark), I went for lunch in the Academy Restaurant on the ground floor of the RA. pen and sepia ink and coloured pencils, 8.5" x 11.5"
the sketches themselves in the Interior Landscapes Gallery on my portfolio website. Designed by Norman Shaw in 1885 and recently renovated by London-based architects MUMA. The Academy Restaurant is an ideal setting for art lovers to relax and enjoy a delicious buffet menu amid celebrated murals by Fred Appleyard, Harold Speed, Gilbert Spencer and Leonard Rosoman. The Murals have been illuminated for the first time, fulfilling the original intentions of the artists. I've uploaded some photos of the murals to Flickr and you can see a slideshow of the Academy Restaurant Murals here. 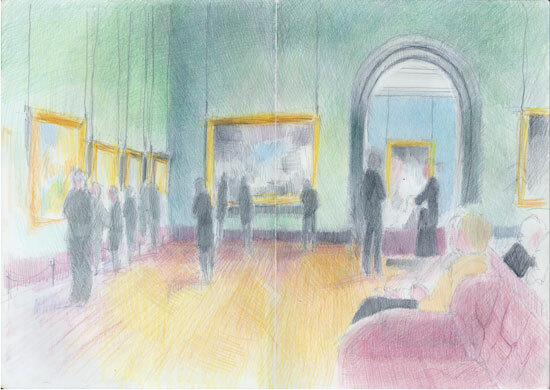 I managed to get a sketch done at the end of the Press View of Sargent and the Sea at the RA on Tuesday. My sketch is of the feature painting in the exhibition 'En Route pour la pêche (Setting Out to Fish)' which is on loan from the Corcoran Museum in Washington. In plotting the key verticals and horizontals on the page I attempt to work out how the canvas might be divided roughly into squares. In essence it's an attempt to work out the ratio of the height to the width - which is always useful to know before you start to plot key marks. I use a pen which makes me focus on trying to get it right first time! In this particular composition, the placing of the figures partly against the sky makes it a lot easier to see them as figures. Earlier studies showed figures portrayed against the foreshore and their clothes became lost in the colour of the foreshore and forms were much less distinct. By putting dark upper torsos against the light sky and the legs of the key figures (left of centre) against the lighter sand it's much easier to see the figures and what sort of people they are - ladies setting out the gather the fruits of the sea. The figures are all 'contre jour' so there's absolutely no need to focus on the faces - especially as Sargent pretty much ignored them as well! It's not a portrait of individuals as much as a figurative painting. I try to get something of the relative values down. This is an aspect which very often cannot be done to the full extent in a short amount of time of sketching. My figures in fact need to be even darker. Using a very soft pencil would have allowed me to get a better range of values - but then I wouldn't have been able to capture the colour in quite the same way. When using the coloured pencils I quickly became aware of how much of this work is coloured greys and darks. There are slivers of pure colour but much of it is "mouse" colours. The overall palette is a "mooch" around the extremes of two complementary colours - a light orange and a dark (Prussian? Cobalt?) blue. I suspect much of the sand and foreshore relates to a mix of those two colours with dans of white and black added. 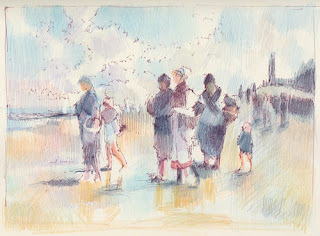 There are lots of pencil sketches in the exhibition - and quite a few sketchy paintings done plein air. One also sees the process of building from sketches and studies through to a complete painting. One curious aspect of the RA's website is that it lists Objects eligible for protection under Part 6 of the Tribunals, Courts and Enforcement Act 2007. 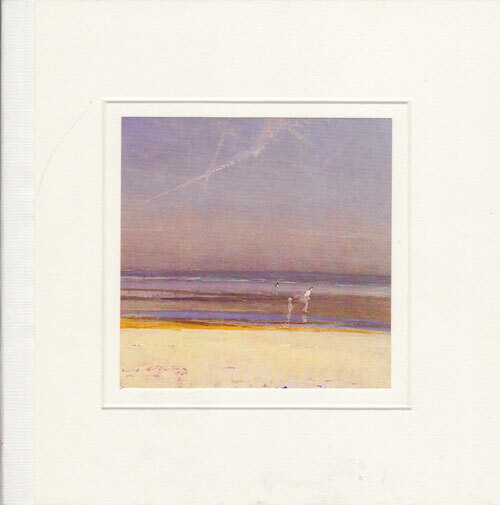 If you then click a link and then take a look at the pdf files listed on that page you get a very good view of sketches by Sargent - mostly in pencil - which belong to various museums in the USA. Sargent and the Sea is on display to the public in the Sackler Galleries at the Royal Academy of Arts from Saturday 10th July 2010. The exhibition continues until 26th September. 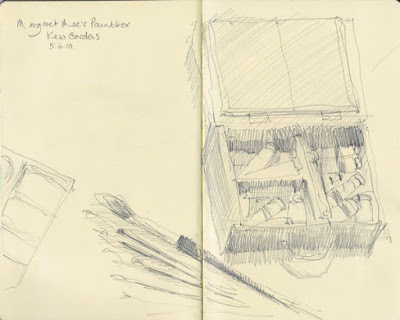 In order to avoid the rush hour after my recent sketching trip to Robert Street and the Embankment, I finished the afternoon with a visit - with my sketchbook - to the Courtauld Gallery at Somerset House. 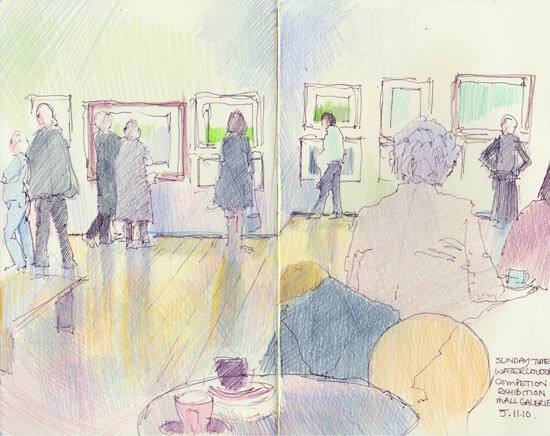 I really enjoy sketching paintings in galleries. If you get the time right it can be a nice peaceful activity and the guards are generally very interested and supportive of your appreciation of the art they spend their working lives looking after. The big bonus about using dry media (eg pencils and coloured pencils) is that I never present the galleries with a problem as I'm not going to make a mess or cause a problem. Fine-tipped pens; all pencils; wood or plastic encased pastels/charcoal or crayons. Paint or other wet materials; charcoal; permanent markers; fixative spray; oil pastels not encased in wood or plastic. 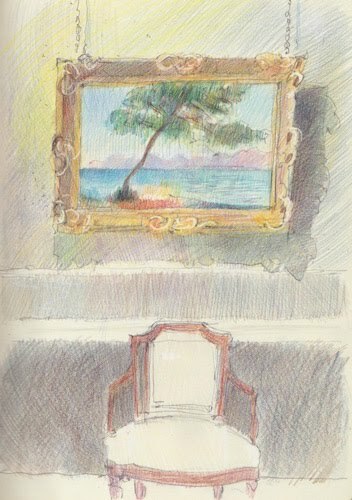 My sketch is of a very famous painting of a tree at Antibes in the south of France. It's one of my favourite paintings and I used to have a postcard of it on the wall of my college room in Cambridge. Antibes was painted by Monet in 1888 and the Courtauld acquired it in 1948. It's really nice to be able to sketch it from "life" as it were! The Courtauld Gallery does have sketching stools available if you ask which means you don't need to take your own. If you belong to the Art Fund, entrance is free. This is 'hot from my sketchbook' having been completed while I sat this morning on the stone steps of the old facade fronting the Lloyds Building (home of Lloyds of London - the insurers). I was in the City to pick up the one drawing which remained after two of my drawings sold at my drawing group's exhibition at the Brokers Wine Bar which is a hop, skip and a jump away. 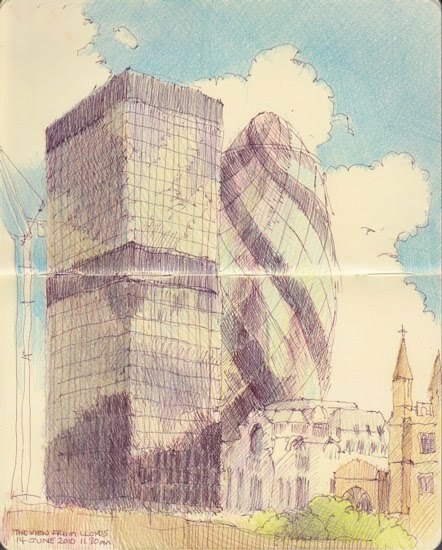 This is where I was sat at Lloyds old home at 12 Leadenhall Street - looking northeast over to St Mary Axe (a street) and St Andrew Undershaft - the very old chuch bottom right located on the corner of St Mary Axe and Leadenhall Street. I particularly liked the juxtaposition of the old and new and the changes in scale over time for important buildings (which you see everywhere in the City of London). Plus I really loved the reflection of the clouds in the plate glass of the building on the left. 30 St Mary Axe is known as The Gherkin due to its shape. It's 180 metres tall and, currently, is the second tallest building in the City of London. It was designed by Sir Norman Foster and is the first ecological tall building in London. It opened in May 2004. The Gherkin stands on the site of the former Baltic Exchange which was very badly damaged by a Provisional IRA bomb in 1992. I well remember the streets around and about after the bombing. Masses and masses of paper absolutely everywhere and lots and lots of broken windows in all the tall buildings nearby. I was working not far away at the time and suddenly began to see the point of the 'clear desk' policy and putting your paperwork away at night. The church located on the corner of St Mary Axe, right opposite the Lloyds Building, is St Andrew Undershaft. It is one of those very rare churches in the City of London. It escaped damage by the Great Fire of London in 1666 and was also undamaged by the bombing during the London Blitz of 1940-41. The first church on the site was built in 1147 and the present church was bult in 1532. It was designated a Grade I listed building in 1950. It was fully restored after the bomb attacjed in 1992 and 1993. A couple of rather special people are associated with the church. 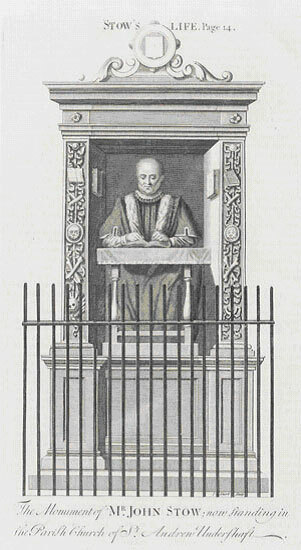 John Stow author of the Survey of London was buried here in 1605. His Survey was published in 1598 and documents the buildings, social condition and customs of London in the time of Queen Elizabeth I. I've got some engravings of his survey and he's always been one of my heroes! Lloyds http://www.lloyds.com/ Lloyd's is the world's leading insurance market providing specialist insurance services to businesses in over 200* countries and territories.